"There's nothing to do round here, we're bored"
How many of you have heard these words, or similar ones, from young people in our villages and towns? Do you dismiss them as generic adolescent angst, or have you stopped to think if there is any justification to them. Research from a variety of sources indicates that the lack of appropriate recreational facilities in the immediate community is a real issue for young people living in rural areas. A commonly held view is that the countryside is an idyllic place to live with lots of open space. However, it is important to recognise that this open space is not public space and that access to the countryside can be very limited in terms of where young people can legitimately go to engage in recreation. With nothing to do young people become very visible in their communities. This visibility can lead to scrutiny and disapproval by adults, which can in turn lead to resentment by the young people. Is this fair? After all young people rarely have a choice over where they live and so become the innocent victims of their parent's aspirations or circumstances and their community's lack of interest. Many would argue that there is adequate provision of recreational opportunities in rural areas through the provision of local playing fields and sports centres. This provision only serves to highlight some issues concerning young peoples access to and the nature of existing provision. Transportation is an important issue for young people when they look to access facilities outside their immediate community. A number of factors including: the availability of transport; its convenience; the added transport costs; and the time taken getting to a facility can make it very difficult for young people to access local sports centres. In addition the very nature of rural roads (fast, narrow, twisty and without pavement) can make them dangerous for young people to walk or ride any distance. Even if they could arrange transport many young people don't want to use the local sports centre because in rural areas it's likely to be 'dual use' and so located at their school. We need to recognise that many young people do not enjoy school and P.E. and so they build up negative associations with the venue. It's also important to consider the nature of existing facilities such as local playing fields and sports centres with regards to recreational needs of young people. The facilities available tend to cater for 'traditional' activities like football, tennis and badminton. 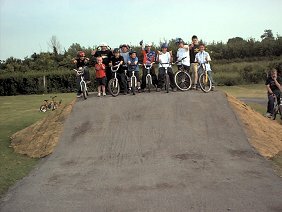 Although this may appeal to some young people there are many who would like to do something different such as skateboarding or BMX riding but can not because there are no appropriate facilities where they can practice safely without upsetting others. But why would we want to provide facilities for young people? There are two perspectives we can use to look at the issue. One perspective looks through the eyes of the young people themselves, the other through the eyes of adults and professionals. Young people are concerned about the unfair nature of current recreation provision. The Rural Development Commission (1997 Survey of rural services) tell us that 53% of parish's have equipped play areas for children. This information does not differentiate between play areas for young children and young people. In South Somerset there are approximately three times as many equipped play areas for children as there are facilities for young people. This inequality is further compounded when comparing the amount of money spent on facilities for these different age groups. The average cost of an equipped play area is �25,000 while the majority of facilities for young people are Outdoor Basketball Initiative sites costing no more than �2,500. "States Parties recognise the right of the child to rest and leisure, to engage in play and recreational activities appropriate to the age of the child and to participate freely in cultural life and the arts". It is clear that we should provide equally for young children and young people but there is currently an inequality in the level of provision of appropriate informal recreation facilities. Why is it that young children are provided for while young people are not? Could it be that there is a historical precedent to provide recreation areas for children but not for young people with the reason for this based around changes in the leisure time? The need for children to play has been recognised and appropriate facilities provided. However, in the past young people went to work at a much earlier age than today, few remained in education. As such there was no reason to provide them with recreational facilities other than those for adults. Today young people stay in education until they are at least sixteen and thus have more time for informal recreation. Society, however, has not adapted to meet this change, antiquated attitudes prevail concerning provision for young people. Could it be that adults just assume that young people don't need informal facilities in the same way that children do? However, this is just an assumption and not based on fact. Indeed if you ask young people many are only to keen to tell you that they want a skating area or a MUGA etc. Don't forget that under European Charter young people have a right to determine their own play facilities not have them prescribed. Both of these standards clearly promote appropriate recreation facilities to meet the needs of young people. However, I would argue that Parish, Town and District Councils look to meet the standards through the traditional provision of playing fields and play areas for younger children and fail to recognise that young people have their own distinct needs. Our interpretation of what should be provided is failing to reconcile itself against the actual needs of young people. The cost of facilities for young people is often used to justify lack of provision. The view is held that villages and towns do not have a sufficient population of young people to merit the cost of appropriate facilities. However, given similar population levels play areas for young children are frequently seen in villages and towns and these can be very expensive to provide. Facilities for young people don't have to be expensive, they can cost considerably less than play areas for young children. It is important that the scale of provision should be appropriate for the community and the population in question, facilities should 'fit in'. This will involve carefully managing the expectations of young people. It if unreasonable for them to expect a large expensive skating area when there might only be a relatively small number of users. 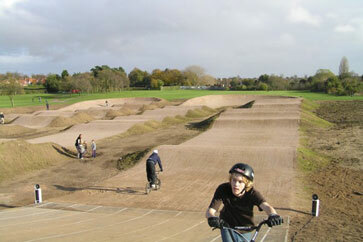 A skating area in a village might consist of a small hard surface (150sqm) with a few select pieces of equipment (jump ramp, rail slide and two 1m high quarter pipes) costing in total something like �7,000. For a small community this should be achievable in terms of available space, capital funding and maintenance costs while a larger area will not. There is also a general fear of providing facilities for young people. "If we provide them somewhere to go there's bound to be trouble." This is a negative way of addressing the problem and I would argue that by doing nothing, by not providing facilities, we create the very behaviour in young people we are trying to avoid. A positive attitude and management of the issue should lead to positive outcomes. There are a number of facilities that young people commonly ask for including. 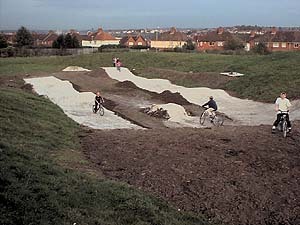 A great deal of ignorance exists about the facilities young people commonly request such as skating areas, multi use games areas, kickabout areas, BMX play tracks and youth shelters. 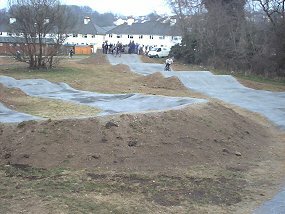 For example skating areas are seen as 'high risk', likely lead to injuries and generate insurance claims against the parish or town council. However, if facilities for young people are provided and managed in the same way as play areas for young children then this concern can be addressed. From an adult perspective a number of topical issues might be addressed by providing appropriate facilities for young people in their immediate community. Health experts tell us that young people are more sedentary, less fit and that levels of obesity are increasing. This has significant implications with regards to the health of our nation in future years. As well as benefits to the physical health of young people there may be benefits to their mental health and development. We need to encourage young people to be more active in their leisure time and not just sit in front of the computer or television. We are not going to do this unless we recognise that we need to provide activities and facilities that are easily accessible and exciting. To engage young people we must respond to their needs and not proscribe opportunities based on our own values. 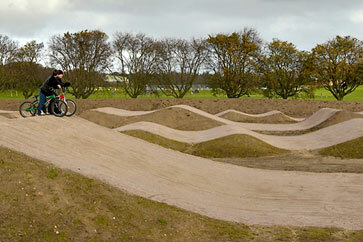 By providing local facilities we may divert young people from anti social behaviour and crime. The Avon and Somerset Constabulary has observed that the age profile of offenders in Somerset is becoming younger each year and suggest that the lack of activities for young people in rural areas is a root cause. It is easy to see why some young people are drawn to anti social behaviour and crime given the lack of legitimate facilities and activities available, the perceived lack of interest by the community in meeting their needs and their isolation. It is not suggested that local facilities are the solution but they might make a significant contribution to alleviating these problems. If communities do not provide appropriate facilities for young people to meet their specific needs the outcome is often community fragmentation. Young people can feel alienated and resentful with an 'us and them' situation developing. This may contribute to the negative migration of young people from rural areas. Young people are not fools, they need to be valued, treated fairly and provided for equally or they will develop negative attitudes to rural life. If rural communities are going to be cohesive and sustainable places then we need to include young people and provide for them. How do we move forward? In the few cases where facilities do exist for young people they have been provided as a reaction to local pressure and issues. Instead of responding to the demand for facilities in an ad hoc manner we need to develop appropriate policies and strategies that will effectively tackle the issue at a district, county, regional and even national level. If this is accepted as a valid issue and strategies are developed, then funding might follow. It is essential to understand that no one type of facility is the solution. Provision should not be dictated by a vocal minority of young people, rather it should reflect the needs of the majority. This can only be achieved through effective consultation involving young people and the wider community.